This article is the first to present a study on the wagar, a sacred wooden sculpture kept by Somali women. This study explores the wagar and its significance as a sacred medium within fertility rituals and the religious syncretism in which such indigenous and non/pre-Islamic practice is appropriated and applied for reproduction purposes. The wagar seems to denote a Cushitic symbol of belief in sacred trees within Somali society. The article further explores the potential link between the wagar and the Sky-God Waaq, adhered to by the Cushitic people of the Horn both before and during the practice of Christianity and Islam. The author suggests that the religious centre of Saint Aw-Barkhadle, located in the twelfth-century Islamic ruined town—which was a major pre-Islamic ritual and burial site according to recent archaeological work—may be linked with the practices of the pre-Islamic religion of Waaq. The article suggests the wagar and phallic gravestones discovered at Aw-Barkhadle and in other parts of the Horn of Africa may be part of Sky-God belief, with an ideology rooted in fertility. Along with traditional archaeological methods, the article also uses the knowledge-centred approach, taking into account local knowledge, oral history and folklore to explore this region’s past. The study of the wagar and the shrine of Aw-Barkhadle contributes to the archaeology of religion and to historical archaeology in the Horn of Africa. 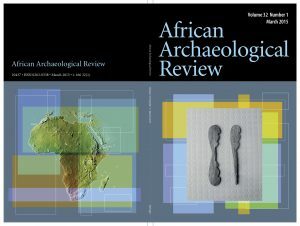 Read full article, OPEN ACCESS: Mire S. (2015), Wagar, Fertility and Phallic Stelae: Cushitic Sky-God Belief and the Site of Saint Aw-Barkhadle in Somaliland, African Archaeological Review 32(1): 93-109. Related publication (Open ACCESS): Mire S. (2006), Gaashaan: Somali shield. In: Hudson, J. and K. Lagat (Eds.) Hazina: Tradition, Trade and Transition in Eastern Africa. Nairobi: National Museums of Kenya. 29-30.